Norway, with its natural beauty and surreal charm, is extremely breath-taking and overwhelming. Home to some of the most dramatic sceneries in the world, Norway is considered to be one of the best places to visit not just in Europe but across the globe. Postcard-perfect towns on the edge of fjords to bright coastal escapades scattered over several islands – the country has it all. The “overall happiest country” in the world, Norway is rich with nature and history on one hand and culture and adventure on the other. Outdoor activities are a regular part of life throughout the year for residents and visitors of this country. 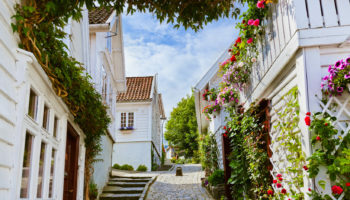 A traveler’s dream, the small towns in Norway are the best way to get up, close, and personal with the country’s culture, lifestyle, and panoramic views. Encircled by mountains, the little town of Lillehammer offers stunning views overlooking River Lågen and Lake Mjøsa. Most renowned for hosting the Winter Olympics in 1994, the town is filled with 19-century wooden structures which have been beautifully preserved. Storgata, the main shopping street in the town, is at the heart of the old city center and is a must visit. Maihaugen is the largest open-air museum in Northern Europe with approximately 200 buildings. The town is also well-known among sports enthusiasts for its offers brilliant winter sport facilities such as ski terrains. For something fun and exciting, visit the Perfect Escape, a themed escape room with three sections, one of which leads you to break into the Bank of Norway and rescue gold. Home to approximately 100 residents and 500 goats, Undredal is a small town most famous for its location along the Aurlandsfjorden and more importantly, its brown goats cheese, also known as Geitost, which is still prepared the way it was made a few centuries ago. The town is also known for housing the Undredal Stave Church, the smallest of its kind in Northern Europe. Goat sausage is another famous delicacy in the town. Once only accessible by boat, Undredal can now be accessed via road as well. An unassuming town on the western coast, Haugesund is often known as the ‘homeland of the Viking kings’. This is where Vikings lived, and Viking kings ruled. 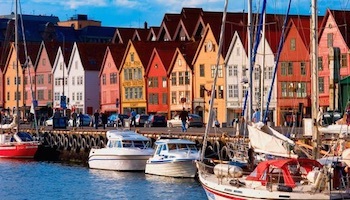 The town and it’s surroundings are filled with almost everything that the country is known for – waterfalls, fjords, culture, Viking history, mountains, sea, and so much more. Explore the Nordvegen the History Centre at Avaldsnes and let your toddlers dress up in real Viking costumes. Visit Åkrafjord, one of the most striking waterfalls in the world. Wander around the lively streets on the dock by Smedasundet strait and take a boat trip to the nearby islets. This cultural town is also known to host several festivals throughout the year. Among the most popular ones are the Norwegian International Film Festival and the Sildajazz Festival. Named after the local fjord of Flekkefjorden, this town is brimming with activities and attractions which can keep you occupied for days if not weeks. Located in between the popular towns of Kristiansand and Stavanger, Flekkefjord offers rail bike tours that takes you through 17 tunnels and some wonderful views of the town. Explore the Dutch Quarter and hike to the potholes of Brufjell Caves. Visit the Flekkefjord and Konstali Gard Museums. And, last but not the least, indulge in some luxury shopping at the niche stores spread across the town. Termed as the country’s “cultural capital,” the town of Harstad is located on the largest island of Norway, Hinnøya and is easily reachable from around the major cities. Known for views of the Northern Lights and the Midnight Sun, the little town offers perfect hiking opportunities and brilliant skiing conditions. It is also a great base for exploring the world’s northernmost archipelago, Svalbard. You could take a ferry or a bike and traverse through the endless rugged mountains, fine white beaches, and hidden coves. Wander around historic communities and experience the outstanding Kittiwake Cliff. For something more relaxing, go fishing or on a whale safari. Narvik is situated on the shores of Narvik Fjord and is a town that dates back to the Bronze Age. It was once inhabited by Vikings and today, the town is home to several interesting tourist attractions and activities. Narvik is known to be the best location	for alpine skiing in the northern part of the country. A cable car to Fagernesfjellet enables you to walk even higher up the mountains and enjoy the unrealistic beauty of the surrounding area. Narvikfjellet, the town’s ski resort, has one of the largest drop heights in Scandinavia. The skies here are mostly clear and are great for admiring the Northern Lights during winter, early spring, and late autumn. When here, pay your homage at the Freedom Monument and visit the Narvik War Museum to educate yourself about the region’s war history. A tiny tourist town with around 250 residents, Geiranger is located in the western part of the country. The towns location at the head of Geiranger Fjord ensures that the town welcomes you with some of the most gorgeous sceneries in Norway. In fact, this small town has been named as the “best travel destination in Scandinavia” by none other than the Lonely Planet. Just west of the town is the Seven Sisters Waterfall which flows opposite another grand waterfall called “The Suitor.” As the third largest cruise ship port in the country, the town receives thousands of visitors every year. A charming fishing town, Henningsvær is a splendid cluster of islands located in the Lofoten archipelago. The coastline is dotted with lively-colored traditional Norwegian homes which appear to be emerging from the sea. Several visitors come to this little town to enjoy activities such as diving, and mountain climbing. Henningsvær is known for its picture-perfect vistas and amazing art galleries that are spread out around the town while Vågakallen mountain stands high in the background. Must visit places in the town include the Galleri Lofotens Hus (a museum and a gallery), Engelskmannsbrygga, and the Kaviar Factory. Also known as Skudenes, this town offers you a view of a lifetime. Imagine hundreds of white wooden houses built in the 1800s lining the streets of the “old town”. Considered as one of the most well-preserved small towns in Norway, Skudenes is host to an annual boating festival “Skudefestivalen” which is known to be largest gathering of coastal culture in the western region of the country. An array of all kinds of boats – vintage boats, old wooden boats, modern boats, tall ships, sailing boats, etc. can be seen swarming the surrounding water. With over 600 boats and 35,000 attendees, this is definitely not to be missed. World’s northernmost settlement, Longyearbyen is the largest town among the many towns located in Svalbard islands. The base for tourism in the area, the town’s ground is permanently frozen throughout the year with snow ranging from 10 to 40 meters deep. At this point, you should know the town of Longyearbyen has no sunlight for 4 months every year (mostly end of October to beginning of March). In fact, the town celebrates the week-long festival, Solfestuka to welcome and celebrate the return of the sun. Instead of gazing at the Northern Lights, Longyearbyen lets you camp under the midnight sun. While here, do take a chance to dine at Huset, the northernmost restaurant in the world. In fact, it is also here that you would find the world’s northernmost ATM, museum, post office, bank, university, and commercial airport! Home to only around 400 inhabitants, the tiny town of Flam receives over 450,000 visitors every year! Why? Because Flam is home to the 20-kilometer-long Flam Line, a railway route between Flam and Myrdal which is not only one of the steepest railway routes but is also undeniably one of the most magnificent train journeys in the world. Downright ethereal, the train journey takes you through the striking landscapes of this charming town and also has a few spirals. The town harbor welcomes approximately 160 cruises every year. The next mind-blowing thing to do in the town is to take a boat ride which takes you through the spectacular fjords and the encircling waterfalls. Another incredible small town in Norway is Reine, which, despite its size, is still a major tourist attraction in the country. And, how could it not! Reine lays on the scenic route that expands across the Lofoten islands. Red and white fisherman huts can be found dispersed around the town and Reinefjorden stands as the backdrop. When here, enjoy hiking and kayaking the Reinefjorden to enjoy an epic view of the Lofoten Wall and of course, Reinefjorden. Take a morning ferry to visit the beaches of Horseid and Bunes. Oh! And, do not miss out on catching the Northern Lights – Reine is considered as the prime location for viewing Aurora Borealis.